I really love the clean look of a white bathroom. 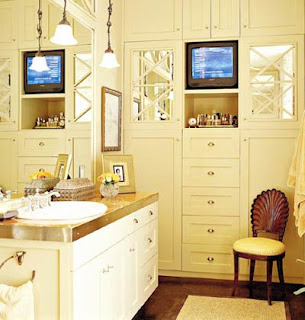 Mirrors and polished fixtures shine in these rooms. Here black-framed art and black-and-white fabrics bring a graphic look to the room. 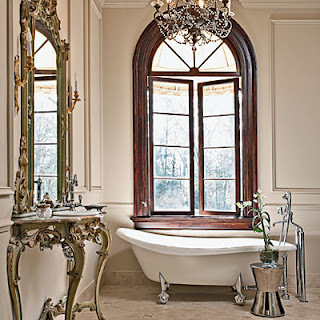 This is a very pretty bath with the palladian window being the focal point. White marble floors and counters bring a cool continuity with the only color coming from the rug. I like the little french chair holding towels. 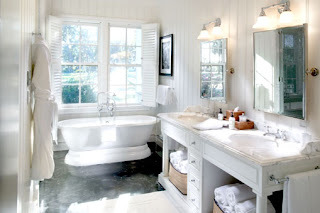 This bath combines white and cream tones very effectively. The built-in cabinets bring a lot of function to a small bath. I like the mirrored accent doors here. This is my favorite bath in this collection of images. 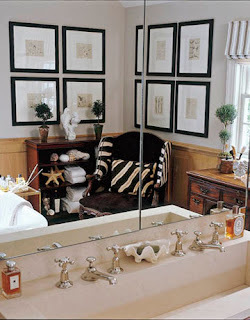 I love the black-and-white marble floor and the vintage tub. Again, a fabulous little chair holds towels and offers a place to sit if needed. This room is classic and would never seem dated. I see a pattern developing here! White marble and french furniture. My favorite architectural element here is the mirrored window over the tub, which visually expands the room and brings the outdoors in. 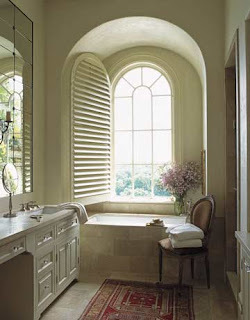 I really like this arched niche for the tub. The simple window treatment adds just enough softness. Architectural elements offer the only color here, which makes them really stand out and shine. A great example of how classic pieces used with restraint are ageless. I love the black and white floors as well. You are right it is classic as are your posts you have quite an eye for enduring style. My husband and really enjoy your blog. We share the same taste!